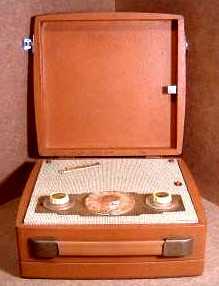 The Ever Ready Sky Countess is, I believe, the last of the valve portables made by this particular manufacturer although not the last of the 'Sky' series receivers - the 1959 'Sky Captain' marking the switch to non-royal transistors. There seems to be no service data available for this model and they are seemingly rare. The model series exited with a brief fizz - the design is unexciting and performance mediocre.